A couple of weeks ago I had a very positive week – a series of events that inspired me and reignited my motivation to be a ‘clinical academic’ (or rather, my full title: Clinical Doctoral Research Fellow (CDRF))! The opportunities this role is already providing, and will provide in the future, are unique and certainly would not have been available had I continued in my full time clinical role as an Occupational Therapist. My encouraging week was made up of three separate events: the CDRF Conference, teaching undergraduate Occupational Therapy students, and meeting a final year OT undergrad to discuss clinical doctoral research fellowships. This was an event for clinical academics within the Faculty of Health Sciences at the University of Southampton. I presented my first ‘3 minute thesis’ style presentation which was nerve wracking! It seemed to go well as it was followed by some engaging questions and positive feedback. Thankfully I was first up so could relax and enjoy the rest of the afternoon. I’ve said it before: hearing about other projects and the variety of professions doing research makes me excited to be part of something bigger. A PhD can be a lonely journey, perhaps especially when pursuing a clinical academic route – you can read more about this in my previous blog post “Should Clinical Practice be Secondary to Academic Research?”. Listening to talks about other research topics and seeing people present from various stages of the PhD process makes me feel part of a collaboration of people who are fired up and set to change the scope of our future health care. It was really encouraging hearing from Annabel Rule and Lotty Brooks – our trailblazers who are (almost) out the other side of the PhD. Both also happen to be Occupational Therapists! They presented on their roles since completing their PhD: each very different but comforting to know how many options there are following this. Annabel (in the final stages of her thesis write up) has taken a more clinical route to begin with, managing a team of Occupational Therapists in older person’s medicine in acute care. This job is very relevant to her PhD research project! She described how, despite it being a clinical role, her skills and expertise gained during the PhD are invaluable. My favourite quote: “being a clinical academic is a state of mind – not just a job role”. This is a challenge for me to continue to be a “Clinical Academic” in my mindset, whatever happens in 2 years’ time – always keeping impact on clinical practice at the forefront of my research mind, and always implementing research skills and evidence based practice into my clinical work. 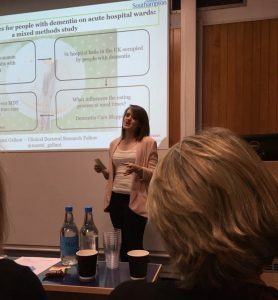 Just a couple of days after the conference, I co-facilitated a workshop for undergrad Occupational Therapists about communication with people with dementia (stay tuned for top tips in my next blog post!). The group were really engaging, asking lots of questions which made us realise how much we have learnt in our time as clinical academics researching dementia care! Afterwards we were able to feedback to each other, with some positives and negatives about teaching and facilitating techniques. What an amazing opportunity, just 2 years into the role. It made me realise how I can inspire the next group of Occupational Therapists – not only in becoming excellent health professionals but also promoting the need for research in practice and even the clinical academic role. As if to consolidate my feelings, the same afternoon I was able to meet for coffee with a final year Occupational Therapy student to answer questions about the clinical academic pathway. It was ideal timing for me to honestly reflect on, and share, my journey so far. It is great to be able to encourage others to take on the challenge of embedding research into clinical practice, while continuing to grow and develop as an Occupational Therapist in practice. I had a lovely email that evening from the student expressing her excited anticipation of applying for the clinical academic doctoral post – the perfect ending to an inspiring and motivating week! You will know this from following my blog posts so far! Still, this week of sharing the ride, influencing and inspiring others, was exactly what I needed to consolidate my enthusiasm about the clinical academic role. It was just the push I needed to keep going, enjoying the opportunities I have now and keeping my eye on the goal ahead!